Long before the revived Fast & Furious franchise became a multi-billion dollar property, Vin Diesel stole every scene as the goggle wearing antihero Riddick in Pitch Black, a sci-fi horror yarn starring Radha Mitchell and Cole Hauser, where Diesel's star power shined brightly, even through the movie's awesome dark atmosphere. Here we'll take a look at 10 things you never knew about Pitch Black. Pitch Black writer/director David Twohy got his start as a screenwriter, working on Critters 2: The Main Course, Warlock, The Fugitive, Terminal Velocity, Waterworld, and G.I. Jane, plus two he also directed: Timescape and The Arrival. "Critters 2 is something I'm still not terribly pleased is on my resume," he deadpanned to Starlog in an in-depth feature published in 2000. "Sometimes, over a writer's dead body, things turn out well and sometimes they don't. As a writer, you just don't have control over that. The only way it gets better for the writer is if the writer directs." Interscope approached him in 1998 with a story a couple of other writers had cooked up, promising that if he could refine the screenplay, they'd let him direct. The original script was by the brotherly duo of Ken and Jim Wheat, who'd worked on horror sequels like A Nightmare on Elm Street 4: The Dream Master and The Fly II, as well as the Star Wars TV movie Ewoks: The Battle for Endor, which they also directed. Their script was called Nightfall. The broad strokes were already in place: a crash-landing on an alien planet, the big eclipse, a photophobic monster. In their drafts, the convict was female. Twohy had done some early work on what would become Alien 3. Everyone involved knew Pitch Black bore a lot of similarities to ALIEN. So the director insisted they make some changes, particularly when it came to character arcs. "Even ALIEN had stock characters who merely reacted to what was going on," he explained. "I've got three characters in this film who not only change from where they begin but also change from where you expect them to end up." Keeping an eye on the character arcs and continuity proved even more challenging than the blue screens and effects. "I had three leads, and they each thought they were the lead, which made for a lot of ego problems on the set," the director explained. "But ego problems are not always a bad thing." For The Arrival, he only had one lead to focus on: Charlie Sheen. "Fortunately, Charlie was fairly sober during that whole experience," he said. They didn't want big names. Pitch Black was made for a modest production budget of $25 million. While the studio kicked around some A-list names for a moment, the director insisted they go with fresher faces, in order to up the action and suspense. "Let's face it, if Nicolas Cage is in the movie, you know he'll be standing at the end of the day," he explained to Starlog. Two short films Vin Diesel wrote, directed, and starred in impressed Steven Spielberg, who gave him a small role in Saving Private Ryan. Diesel was the voice of The Iron Giant, as well. Cole Hauser, the leader of the Nazi gang in Higher Learning and one of Will Hunting's pals, would later appear in 2 Fast 2 Furious, which coincidentally was the only Fast & Furious movie without Vin Diesel. The contact lenses worn by Vin Diesel were prototypes that had never been tested or worn before. In an interview with Coming Attractions around the time of the film's release, the actor described them as something like the hubcaps on "your father's 1960 Plymouth." On the first day of shooting, they had to fly in an optometrist from three hours away to their remote location, because they couldn't get the contacts off. Diesel was later taken to the hospital to make sure his eyes were OK. Even with the contacts, there were a handful of CGI enhancements. "They would accent a moment in a sequence and punch up the effect a little bit," Diesel explained. "Add a little light in the eyes. For the most part, it was just contacts." The Pitch Black team were careful to avoid the look and feel of well known cinematic creatures we'd seen before, specifically Godzilla, the velociraptors of Jurassic Park, and of course, the creatures of the Alien franchise. In a Fangoria cover story, the movie's FX supervisor described Pitch Black's monsters, which are blind and use echolocation to hunt prey, as "a great white shark melded with a pterodactyl, with the killer instinct of a lion." He added that, "the creature in Alien had a very strong intelligence and a very hierarchical system; this thing will kill its own kind." It was cold in the desert. Pitch Black was filmed in the Australian desert, for both budgetary reasons and the overall look. There were six-day weeks and 17-hour days. It was also wintertime in Australia, which meant it was relatively cool outside. The actors were misted with water to give the appearance of sweat. The Australian Outback has served as the backdrop for many films, including The Road Warrior, Mad Max: Beyond Thunderdome, Priscilla, Queen of the Desert, and of course, Crocodile Dundee. The ship is still there. A local shop owner in the Australian town of Coober Pedy, situated 500 miles north of Adelaide, bought the spaceship prop from the Pitch Black production. As recently as 2016, it still sat outside, next to some showers and toilets. The opal mining capital of Australia's towns people mostly choose to live underground, where there are residences, shops, churches, a campground, and even a golf course. It wasn't planned as a franchise. 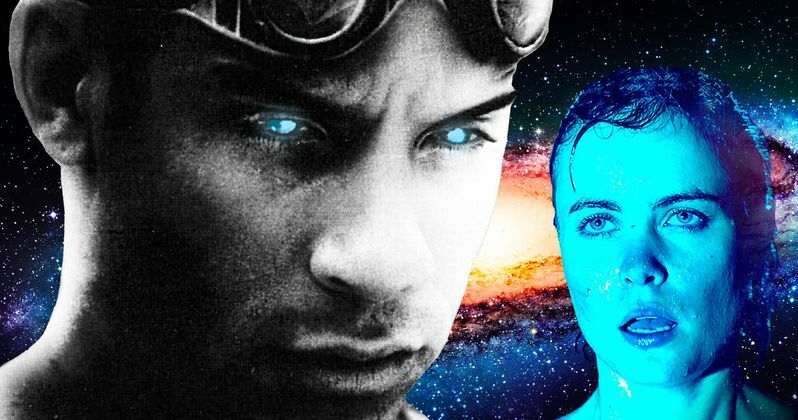 Since Pitch Black was released in 2000, we've gotten two more theatrically released films about the Riddick character, as well as a number of animated features, video games, and novelizations. In late 2014, Diesel announced plans for the long discussed fourth installment, as well as a TV series called Merc City. But as Twohy explained in a 2013 interview, "I was just trying to get out of Australia with my skin, without the bond company coming in and tacking my hide to the side of a barn." It wasn't until audiences started to respond to the Riddick character in test screenings that the director started to think they were on to something. "We certainly didn't plan it as a franchise," he told Screen Rant. "We were just so consumed with trying to make the first movie work." The Pitch Black novelization contains a few differences. It offers more backstory for Riddick, explaining he was a Company soldier turned whistleblower, exposing some black ops nastiness. Jack is introduced as Audrey from the start. In the book, as in the original Pitch Black script, Imam and his followers practice Chrislam. The blended faith is also mentioned in Riddick video game Escape from Butcher Bay. There's a much deeper connection between Pitch Black and the Fast & Furious franchise than what's on the surface. During production on Pitch Black, the studio folded; Universal came in at the eleventh hour and agreed to release it. "It was kind of a Hail Mary, it predated The Fast and the Furious, but led into that relationship," Diesel explained in 2012. He said he turned down $20 million to star in 2 Fast 2 Furious, opting to take $50,000 to do a WGA draft of Chronicles of Riddick, a big-budget follow-up to Pitch Black released in 2004. While making the R-Rated Riddick in 2012, the actor told a roundtable of journalists, "[We're] sitting on this set because I did a cameo in Tokyo Drift. We leveraged this cameo in Tokyo Drift so hard, to reboot a franchise that was literally dying." Diesel got his second chance at a Pitch Black follow-up and eventually, Universal got Dom Toretto back in the driver's seat.